OVER TEN THOUSAND dollars have been raised for a Cork expat and her six children who were left homeless after wildfires in California destroyed their home. Zita Harrington Biehle, originally from Berehaven, had to evacuate her home last month as the Carr Fire grew closer to Redding, California. The Carr Fire has proven to be the deadliest of nearly 20 major fires raging across California, having previously claimed seven lives, including two firefighters. A GoFundMe page was set up to raise money for the family, who are now living in temporary accommodation. “Please help out this amazing woman and her family get the necessities like clothing and food and toiletries to get back a little normality in their lives,” the donation page said. The page has raised over $10,000 for the family so far. Zita works as a paramedic in Fall River and was coming off a late shift when she heard there was a mandatory evacuation across the river from her home. Speaking to the Irish Independent, Zita said she thought they were in the “safest place possible” but that all changed when she got home from work. “Just in case we would have to evacuate, I got someone to pick up the kids. Within two or three minutes while we drove home, everything changed. We could see flames, what was nothing before was now all brown,” Zita said. The family went to an evacuation centre for those left homeless by the fires and are now living in temporary accommodation close to where Zita works. Last week, Zita posted on the GoFundMe page to thank everyone for their support so far and said they had returned to what was left of their home to see what they could salvage. “My daughters so very determined to find things in the ashes. We did find a couple of cups and dishes but that’s about it. One day at a time, one step at a time, kids and I will get through this thanks to everyone’s support. “Hard for kids going to where their bedrooms were, digging as best they can, trying to find something, anything,” Zita wrote. The death toll from the California wildfires rose to 10 on Thursday after a heavy equipment mechanic assigned to the Carr Fire was killed in a road accident, according to local authorities. Two other people have died in the Ferguson Fire, which has forced the partial closure of Yosemite National Park. The Carr Fire is 48% contained but has burned through 177,450 acres since it ignited on 23 July. The biggest fire currently is the Mendocino Complex fire, which actually consists of two big fires –the Ranch Fire and the River Fire – that together have consumed more than 300,000 acres. 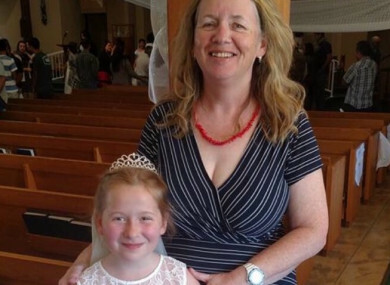 Email “Over 10k raised for Cork mother of six left homeless by California wildfires ”. Feedback on “Over 10k raised for Cork mother of six left homeless by California wildfires ”.